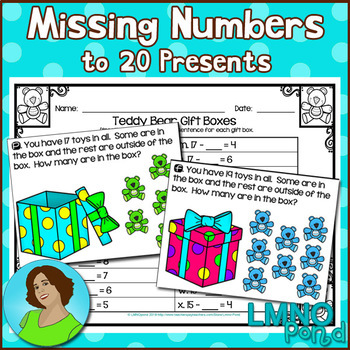 Do your students need practice finding missing amounts to 20? Are you looking for a fun, colorful set of task cards to grab their attention? Check out these Missing amounts to 20 task cards. You'll love the practice with number sentences with missing addends. They'll love the cute teddy bears and presents. Teaching Tip: Laminate cards after cutting them out. Allow students to draw in the missing quantities to count up to the whole amount (using a dry erase marker).